Let’s face it, you must stay healthy if you want to fly for years with the same energy you had soon after you finish you initial training. We all know this and we take care of ourselves by bringing our own food onboard, avoid touching tempting sweets and goodies. However, staying healthy is also about keeping our body fit and avoiding injuries. Having a injury onboard is a catastrophe. Mainly because if the company determines that it was your fault, you are left without a job and a paycheck. Most companies offer tips during their initial training on how to handle containers and trolleys. Reality is that most of us do not follow those advices. There are many reasons: Lack of time being the main one. But if we want to stay healthy and in one piece, we must make time. Before moving a container, take each drawer out if they are too heavy. 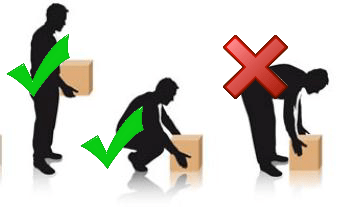 Keep your back straight while putting a container down. Bend your knees instead of your back. Ask for help, you’re not alone. Do you find yourself pushing trolleys and giving 50+ trays to customers? Most probably you work in economy. Well, if you got to work in economy, at least don’t break your back. Bend your knees when reaching for trays and items inside the cart. Yes, you will get a free workout too. While they don’t happen that often, they are still potentially dangerous. Especially when you constantly have to serve boiling-point tea and coffee to a caffeine-loving flying society. What about those 300 C° ovens you have to touch? Be careful when preparing tea/coffee at the galley. Most airplane’s boilers seem to be alive. They have their own personality, water flow changes at any time, and they tend to spray you on your face to keep you awake. Keep your face as far away from the tap as possible. Operate the tap with the hand you need the least if worst happens. Before going in the cabin, release the flask pressure. Not only for the passengers safety, but yours too. While serving tea/coffee in the cabin, stop if it gets too bumpy. Yes, it may spill on passengers, but chances are 50-50 it can spill on you too. I would add, serving only a half-full cup of that marvellous hot drink, is not going to affect their experience. For the ovens, the best practice is to have a good insulated oven gloves. The best gloves fit your fingers individually rather than the normal ones you would use in your house kitchen. They also must be long to protect your forearm. That way you’ll be safer. Easy one, if it is not safe for the passengers, then it’s not safe for you to be walking around. Reality is we still have to continue with the service when going through a light, and sometimes even moderate turbulence. Use your own discretion. If you feel unsafe, take the nearest seat. Better safe than sorry. And at the end of the day, if there is an injury due to turbulence and the seatbelt sign was on, I see little chances of getting it cover as an industrial injury. They may say it will be cover, but do you really want to find out? No, thanks. Does it ring a bell: “Dead by a thousand cuts” every time you operate a galley. It doesn’t matter how careful and skilled you are. You will get them, or better said, they’ll get you! Little things you can do to lower the chances of getting cuts are: Staying hydrated and keeping your skin in its best condition. If your skin is dry, it will easily open up and get wounded when anything touches it. If you are allowed to use gloves, do so to reduce the chances of getting cuts. Maneuver carefully in the narrow confines of most galleys. Avoid those sharp edges that seen to be everywhere, especially on the older planes. 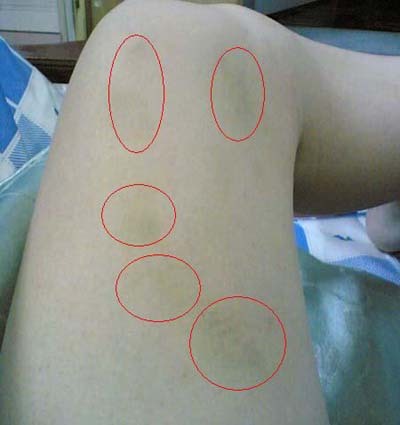 We all have a collection of bruises we don’t remember where we got them from. But then we don’t need to think too long to remember that our body goes around banging carts, containers, colleagues, passengers, seats, bulkheads and everything that is unfortunate to get in our way. We move faster that light, especially walking down the aisles on non-service times. Again, take your time and be careful. Hazards are everywhere on the plane. Discarded plastic bags or menus on the floor, pillows and headsets for the fancier airlines. Let’s not talk about the legs and heads sticking out the seats that require high pelvic skills to be avoided. If you doing a night flight and the cabin is dark, be sure to turn you night vision. Collect, throw away or push under the seats all those hazards. Another safety concern are unlocked doghouses that can open during turbulence, and can be in your way when walking down a dark aisle. Make sure you lock them every time you use them. We haven’t left out luggage, laptop bags, and shoes. Well, they actually are left outside on the aisle by our passengers. Again, help them by pushing them back to their place. And the best practice of all, spread the message, tell your less experienced colleagues how to stay healthy and safe!